Becoming distracted can be so easy these days. We have our smart phones, Spotify, Netflix, along with so many ads at the tip of our hands that one has to wonder at times how anyone can get things done. To be honest, I have days like these. I have days where I have so many things that needs to be done and yet, there I am, watching my 5th video on YouTube. Procrastination at it's finest if I may say so. 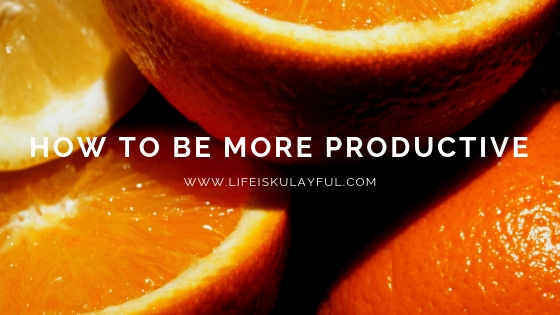 So, how can we be more productive? You may be saying "what? Isn't that what I have been doing when I procrastinate?" When I say set aside time for yourself, I meant, wake up 15 minutes early so you can have time with just yourself. If you are a Mom like me, this is a rare moment and one that we need the most. You may think, I'd rather sleep 15 minutes more and if that works for you, then well and good but you can also try doing my recommendation and see how it benefits you. 15 minutes for yourself improves your mental health. A little peace and quiet that helps remind you of who you are helps your mind become more organized and adds a boost of productivity. When you set aside time for yourself, you are actually setting aside time for your mind to reset and get back on track. When I say dump everything, I mean that put everything that is in your head on a note or list. It can be in digital form (better so that we can save more trees) or paper form if you are old school. What matters is that you list down everything and then you start to sort things out. You can categorize everything into things you need to accomplish ASAP, things that can be done tomorrow, then weekly, then bi-weekly, and finally monthly. This way, you can have a look and see how much time each task need and to clump together everything that you can accomplish together in one go. As a Mom, this is very important because you can forecast your schedule as well as that of your kids. When I say block everything, I mean that you need to block time for things in your life and you need to honor that blocked time. When you set specific time for yourself, for the people around you, and then you enforce it, people will learn to respect your time which will leave you to be more productive because there will be less disruption especially when you are a Mom. Block time for your kids and let them know that this blocked time for them is meant just for them. Work will not disrupt it. When you have blocked time for work, your kids also need to know that unless it's really important or an emergency, they need to respect that time for work and not disrupt you. The same can be applied for time with family, your partner, friends, as well as yourself. When you learn to practice time blocking, you will increase your productivity tenfold. Do you have any productivity tips? Let me know. I'd love to hear about it.